“Let’s Show Grammie and Papa all what you have learned, since the last time they visited,” says our daughter. We walk outside and he can’t wait to be outdoors, so off he runs. Apparently, he has found this new spot around the side of their house that is just his size. When he sits down…it fits him perfectly. He always wants to sit in this corner and have Daddy throw the ball to him. Well, Daddy is a beloved baseball fan…so this is just a great match for the two of them. 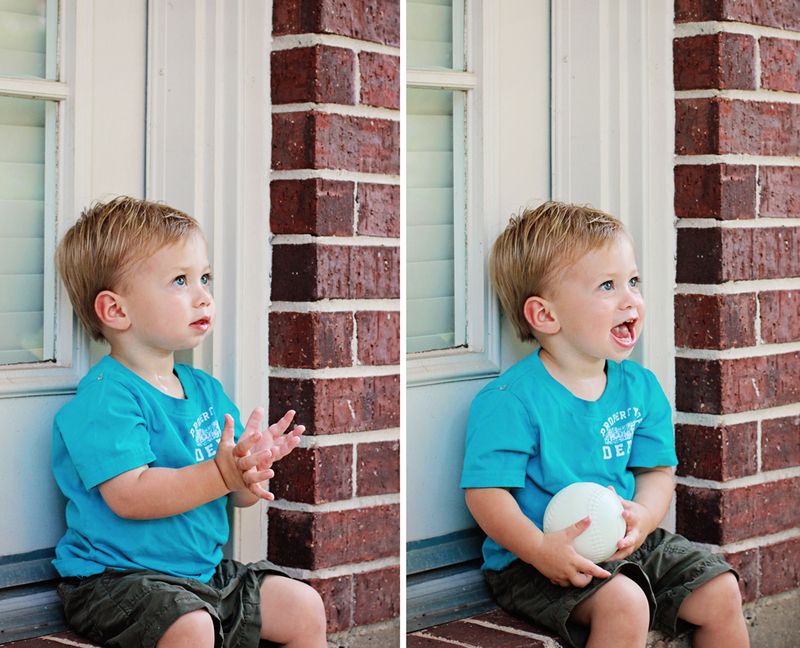 Little Man is doing great in learning the coordination of catching the ball. Of course, every time he caught one…his grandparents went nuts. This in turn brought on big smiles by Mommy and Daddy and as you can see Little Man too! The next thing they wanted to show us was, how he can identify all of his body parts. 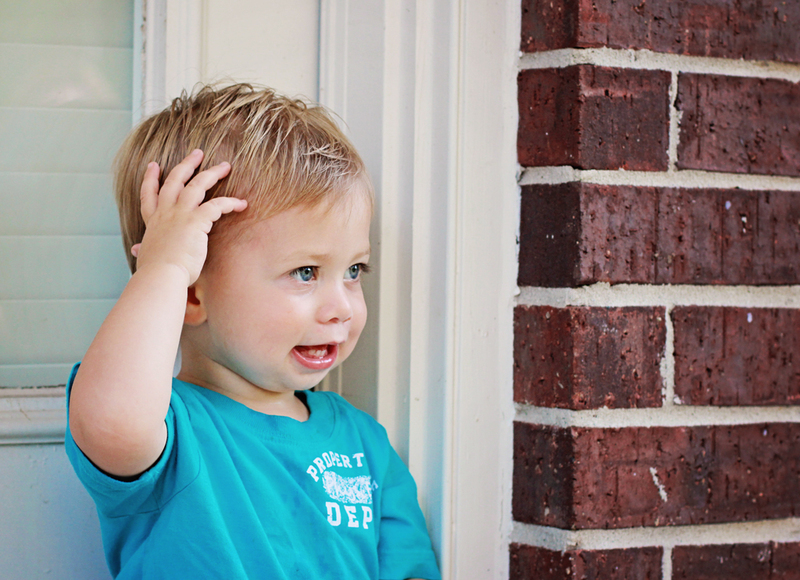 Mommy asks, “Where is your hair?” Where is your elbow? Where are your toes? and on and on…he never missed one. He also has found another place that is just perfect for him! I call it the stone mushroom…out in their backyard. Not to big, not to little…just right. Apparently, he has been told before that he is to leave the little screw cap on this bottle. But he is bound and determined to get this off in front of his grandparents. Can you tell by his reaction to this image, that he knows he is NOT to be doing this? The last thing they wanted to show us was his batting skills. Daddy says, “Little Man” you want to hit the ball with your bat? By this time, he is getting tired! 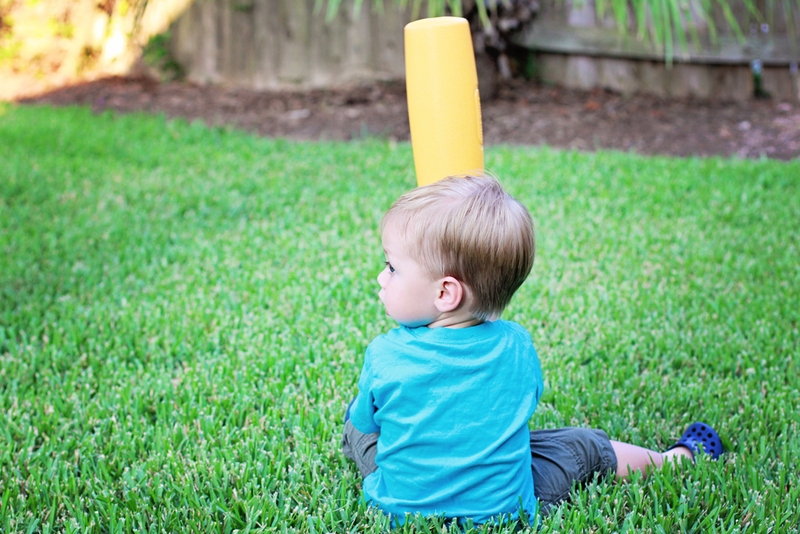 He just sits down on the grass and batter up! What a hoot…we just laughed and laughed. When shooting an image, most of us push the shutter half way to focus, then swing the camera over to the composition/position we want our subject. When you’re recomposing your shot, instead of tilting or swiveling the camera to recompose, try to move your camera so that the sensor stays parallel to your subject. Don’t move the camera, but move your whole body to do this. If you keep the sensor parallel to your subject, you’re much less likely to have it fail by throwing your subject out of the plane of focus. We hope this brought a smile to your face today. Love these… Being a Grandma is the best..
Laurie, your grandson always brings a smile to my face. 🙂 It just seems like yesterday that my sons were that young. Well, what’s not to love? That’s a handy camera tip too, I’ll try that. It’s great to see kids playing outside and sitting on the grass! Oh he is too sweet! Precious little man. I love how your Little Man found a special little nook all on his own! Little Man is so awesome! Snap while you can because he might get to the stage where he won’t let you take his photo and you have to be stealthy about it. So enjoy it while it lasts! I LOVE the picture of him batting sitting down!! What a precious child – so full of life! And thanks for all the wonderful tips – I learn a lot from you! A very big smile indeed! 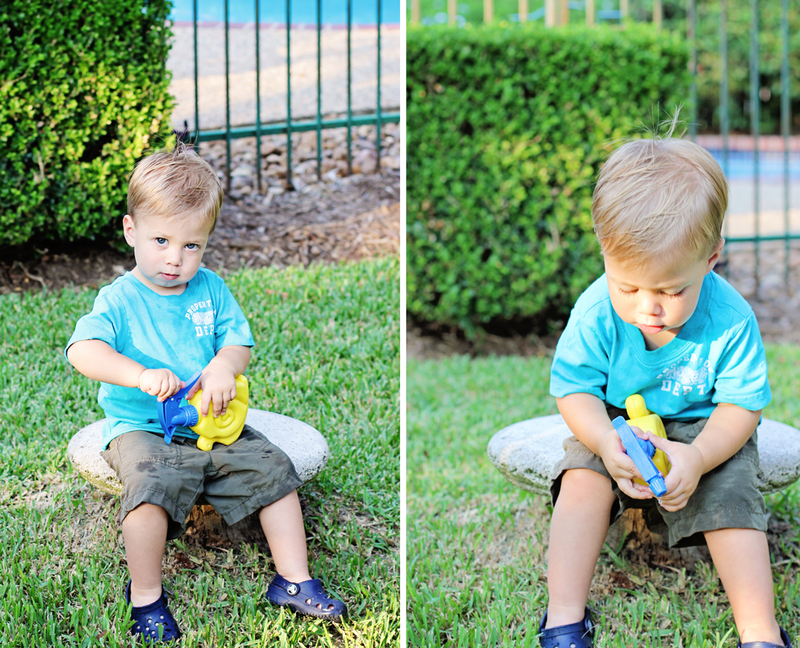 Your daughter and SIL must love the gorgeous photos you take of Little Man! Those blue shoes just complete the picture. Adorable. Beautiful captures of an adorable kid!!! He’s adorable. The photo wear he’s touching his hair is priceless. Is there anything cuter than toddler teeth? “every time he caught one…his grandparents went nuts!” LOL Yeah, I can identify with that! Darling photos of a very, very cute little boy! Beautiful child. My grands are all grown up now…sigh…time flies by! You really capture the little Man’s expression! So adorable! The excitement of learning something new! You’ve got quite the adorable grandson! Thanks for following my blog, and have a wonderful weekend. This really did bring a smile to my face. He is so gorgeous. Fantastic images. Oh, your fun times are just beginning. He will continue to astound and wrap you in splendor. Enjoy the weekend. I often shoot politicians (ok, that can easily be misinterpreted 😉 ) while they hold their speeches. Confronted with low light situations and wide open apertures (f 2.8), I have to struggle with a very small depth of field. So it is quite hard to achieve those nice sharp and crispy images. I am one of those who focus and recompose their image by tilting their cam. I will try to follow your tip and move my body instead of my camera, even if this seems to be more difficult (especially with a shallow depth of field). What a precious memory! Thank you for sharing! The Little Man is so adorable. His expressions are priceless. He will for sure break lots of hearts when he grows up! The girls will go crazy for this cutie!